TGIF!!!!! Thank god right?! I'm super excited for this weekend - since my grandparents are here we've got a busy weekend of shopping, Newport, the beach & celebrating my moms birthday! Just gotta get through work today...seriously yesterday felt like the longest day ever....ever...it was weird. Have you ever had days like that? ok soooo I was apart of this super fun linkup from Megan at Shine On & Angela at Hairspray & High Heels called All Lacquered Up! It's pretty simple, you get matched up with someone & you send each other some nail polish! I LOVE nail polish & painting my nails weekly so of course I wanted to play! I got paired up with Haley from Haley's World which was awesome because I already knew her & her blog! So we emailed each other to get an idea of what type of colors we wanted - we both wanted darker, more fall like colors....duh! Sooo I was super excited when I got her package & there were 2 fabulous colors from OPI - A fun navy blue with some shimmer called 'Yoga-ta Get this Blue!' & 'You don't know Jacques!' 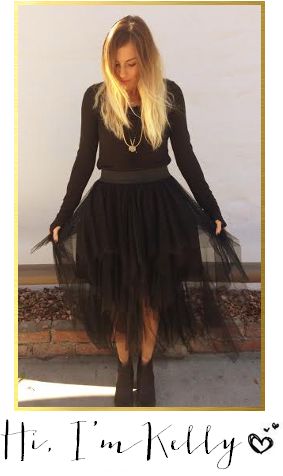 which has turned into my new fav fall color ----> so much so that I sent one to this pretty lady for her birthday. Sooo of course I painted my nails instantly... so what do you think? thank you again Haley!!! 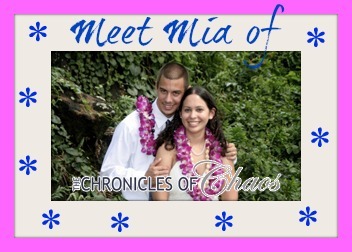 Hi there, I'm Mia from The Chronicles of Chaos. No, it's not a comic book, but sometimes I do feel like SuperMom! I started blogging to capture the chaos that reigns supreme when you have 2 parents who work full-time, 2 rambunctious boys, and a Black Lab who has never outgrown the puppy energy! And I sprinkle in some recipes, and other life ramblings in the mix as well. Stop by and say hi sometime, I love meeting new people! Of course, I would spend my last day with my sons and my hubby. I would take them to the beach and enjoy the relaxing sounds of the ocean and watch my beautiful boys playing and having a great time. Welllll... this is embarrassing, but I'm going to say it anyway. I'm 29 years old and I flippity flappin love Justin Bieber. I really did try to hate him... I did. But every time his music comes on the radio, I make sure my windows are rolled all the way up and I JAM OUT! :) *don't*judge*me! 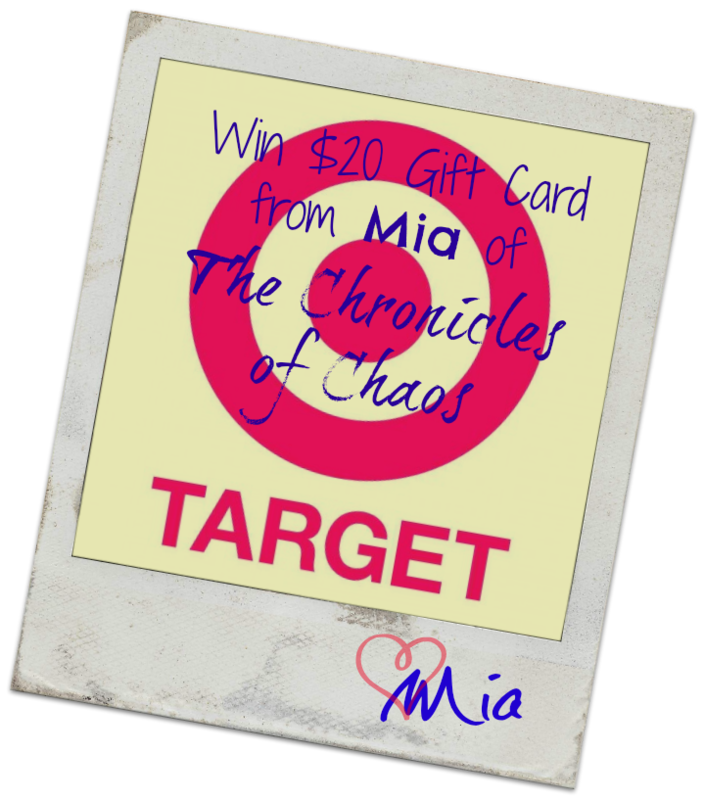 So I'm not gonna lie I did enjoy that Bieber song 'boyfriend'...hmmm.....ok moving on soooo today Mia is giving away a $20 gift card to TARGET!! I think what I love the most about Target is with just $20 you can still get a lot! SO you know what to do - & if you're new around here I highly suggest being logged into your email, facebook, pinterest, & twitter accounts. It will make your life SO much easier! GOOD LUCK! A night sitting by the fire pit with my BFF and long phone conversations with my "it's complicated..." oh the weekend Enjoy your grandparents! Loving the new blog design friend! So cool to watch your site grow. This weekend I am most looking forward to a fancy date with my husband! I'm most looking forward to spending time my husband and kids. It has been a long week! love the color girl! have fun with the grandparents! 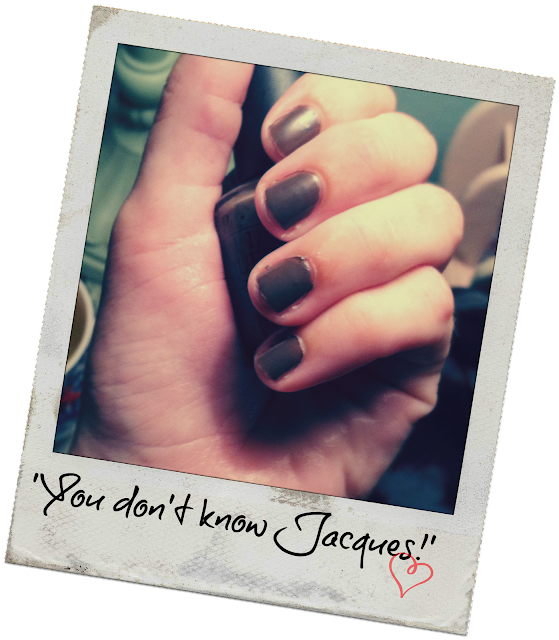 I found You Don't Know Jacques a couple years ago and I lovelovelove it! hi kelly! i LOVE love your new blog design :) I am looking forward to watching movies--i just rented, The lucky One! and I am planning on making some cards this weekend too and putting together a couple gifts. p.s. have a great time shopping with your grandparents and celebrating your mom's bday! I LOVE my grandparents. they come visit me every wednesday (they live an hour away). sounds like your gonna have a heck of a weekend! Awesome! A weekend I have NOTHING to do - is that a good enough answer because it's gonna be NICE!!!! haha. RELAXATION! LOVE that shade...and OPI!! Tanks for participating, love!! We're going to brunch on Sunday and I can't WAIT to grub out! Brunch is my fave! Okay, first off, I must say, Mia is so awesome!! Thanks for hosting the giveaway! And second, what I am looking forward to this weekend already happened. haha. Got to spend some time with the boyfriend before he heads to Charleston tomorrow morning for a little vacation. Thanks for hosting the giveaway! LOVE MIA! Ive been most looking forward to resting this weekend. Its been nice to just chill at the apt! Great giveaway host! I am really looking forward to hitting up the Texas State Fair this weekend! I hope it's cool enough in Dallas to bring out the ol' boots for the first time this year so I can look and feel like Fall...Have a great week! My nephews birthday party is this weekend, it's always fun!! Thanks for the giveaway! Putting up all our Halloween decorations! :) I always try to do it the last week in September/first week in October. I'm most looking forward to not working LOL!